There are several reasons that Los Angeles artist Marlene Louchheim decided to donate one of her sculptures to Congregation Micah. “Congregation Micah is very committed to Jewish life,” said Louchheim, who was in Nashville last month to take part in the installation of the piece. The sculpture was part of a four-piece exhibition called “Commitment: Gathering Sparks” that went on display three years ago at the Hebrew Union College-Jewish Institute of Religion’s Jack H. Skirball Campus in Los Angeles. At the time, Louchheim said she created the piece in memory of her brother, Wally Marks, who was committed to giving back to humanity and fighting for global justice. Louchheim wanted to find a permanent home for the piece at a Jewish institution where, as a symbolic representation of her brother’s outsized commitment to social justice, it could be an inspiration to young people. “That’s why it’s so big,” she said. The sculpture will be installed behind the sanctuary along the path to Micah’s memorial garden and cemetery and will be visible through the sanctuary window. Burlap, bronze, and nickel with found rocks, each placed one by one. Re-printed from the October 28, 2010 The Desert Sun “Valley” newspaper. Isn’t it great when a work of art suddenly appears somewhere in your city? 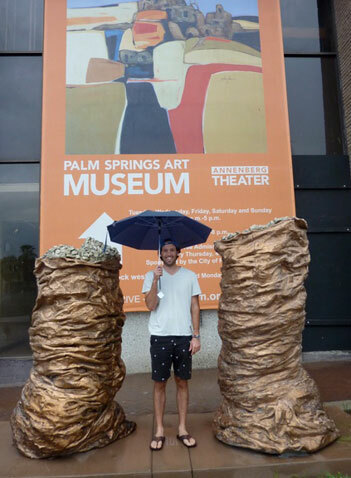 A sculpture resembling a pair of wrinkled legs or tree stumps has popped up at the corner of North Palm Canyon Drive and Tahquitz Canyon Way, a busy intersection in downtown Palm Springs. The artwork is called “Together Again,” and it was created by artist Marlene Louchheim, according to the city of Palm Springs. Made of burlap, polished bronze and nickel silver, it was installed in August. The Public Arts Commission voted in February 2009 to recommend city leaders accept the donated sculpture. The location was approved in November 2009. The sculpture will stay at the street corner in front of the former Bank of America building until further development takes place there. We’ll leave it up to residents to decide what it is they’re looking at, though. In fact, let us know what you think of the sculpture. Maybe we’ll share some of your ideas in the next week’s column.